Univ Of Minnesota Press, 9781517901813, 240pp. 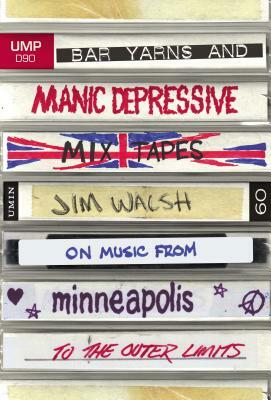 Bar Yarns and Manic Depressive Mix Tapes distills thirty delirious, jam-packed years of some of the best music writing ever to come out of the Twin Cities. As a writer and musician, the ever-curious Jim Walsh has lived a life immersed in music, and it all makes its way into his columns and feature articles, interviews and reviews, including personal essays on life, love, music, family, death, and, yes, the manic-depressive highs and lows that come with being an obsessive music lover and listener. From Minneapolis’s own Prince to such far-flung acts as David Bowie, the Waterboys, Lucinda Williams, Parliament-Funkadelic, L7, the Rolling Stones, the Ramones, U2, Hank Williams, Britney Spears, Elvis Presley and Nirvana, Walsh’s work treats us to a chorus of the voices and sounds that have made the music scene over the past three decades. The big names are here, from Rosanne Cash to Bruce Springsteen to Bob Marley and Jackson Browne, but so are those a little shy of superstardom, like the Tin Star Sisters and Uncle Tupelo, Son Volt, the Gear Daddies, Semisonic, and The Belfast Cowboys. The book is also a tour (de force) of the Twin Cities' most celebrated music venues past and present, from the Prom Ballroom to Paisley Park to Duffy's. When Walsh isn't celebrating the sheer magic of live music or dreaming to tunes blasting from the car console, he might be surveying the scene with the Hamm's Bear at Grumpy's or the Double Deuce or singing the last night at the Uptown Bar blues. Whether he's dishing dirt with Yoko Ono or digging the Replacements' roots, giving an old rocker a spin or offering a mic to the latest upstart, Jim Walsh reminds us that in the land of a thousand lakes there are a thousand dances, and the music never dies. Capturing the pure notes and character of the sound of the Twin Cities and beyond, with a keen eye for trends and the telling detail, his book truly is a mix tape of thirty years of unforgettable music. Jim Walsh is a Minneapolis-based writer, journalist, columnist, and songwriter and the author of The Replacements: All Over But The Shouting: An Oral History and, with Dennis Pernu, The Replacements: Waxed Up Hair and Painted Shoes: The Photographic History. The former music editor at City Pages and pop music columnist at the St.Paul Pioneer Press and current staff columnist at the Southwest Journal and a regular contributor to Minnpost.com and others, Walsh has published in Rolling Stone, SPIN, the Village Voice, the L.A. Weekly, the Star Tribune, Melody Maker, Billboard, the Utne Reader, and has been a recipient of the John S. Knight Journalism Fellowship at Stanford University. He is the former leader of bands REMs, Laughing Stock, and The Mad Ripple, and the ringleader behind the 10-year-old singer/songwriter showcase The Mad Ripple Hootenanny.